Like effective resume writing, increasingly popular Chinese sidewalk water calligraphy is evidence of professional-level expertise, a sample of writing ability and, of course, an art form. Less obviously, water calligraphy is a good guide to constructing both a resume and the life behind it, by being so very different from what each of these so often is. The most obvious and least profound way in which water calligraphy differs from a typical resume is that, as visible evidence and information, what is written in quickly-evaporating brushed water has to be updated every five minutes or so—irrespective of whether the writer is or isn’t looking for a job. But then, there are also the more interesting, subtler and deeper differences. Although it is uncertain or unlikely that the average Chinese street calligrapher is job hunting—even for a job as a calligrapher, in water calligraphy’s fleeting charms and delicate surface messages are deep, lasting lessons for job seeker and wisdom seeker alike. 1. Your resume, like anything else you write, is not really a personal monument: It may be tempting and typical to think of our resumes and CVs as being monuments—lasting testaments not only to our career and personal accomplishments (whether monumental or merely pebbly), but also to our very existence, its mission, merits and outcomes, all summed up in whittled and chiseled form(ats). Like the Great Pyramids of Egypt, resumes are assembled from the bottom up, patched up when necessary, but built to lastingly celebrate and promote us, like modern Pharaohs. 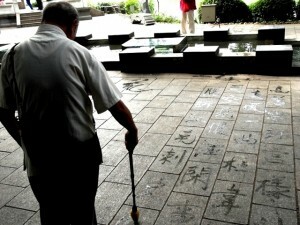 Ironically, water calligraphy uses stone pavement slabs to convey precisely the opposite message of stone pyramid blocks: Water calligraphy conveys an evaporating, watery message about ephemeral success and importance, but timeless existential truth, instead of a pyramid’s visibly enduring solid reassurances of the enduring importance of their creators, as eternal illusions. The lasting message of water calligraphy: Your resume, your career and your life are more like water on stone than stone on sand. So, stay humble, fluid and comfortable, if not thrilled, with endless change and evanescence, whether at work or in the rest of life. 2. The best resume is one that is continuously updated or recreated: Just as job seekers are vulnerable to being seen as or to seeing themselves as human resources, i.e., commodities or “products” to be secured or disposed of at will, rather than as process-defined “projects”, they are also inclined to regard their resumes as likewise being market-ready products, resources and commodities (with a certain or uncertain market value), rather than ever-evolving projects and processes. If they see anything as fleeting, it is the job opportunities, not the resumes designed to seize them. Here, again, water calligraphy makes the opposite point: If the water-brushed sidewalk poems, Chinese characters and proverbs are seen as resumes—of a spiritual, rather than a career path, they function as and evidence an essentially evanescent process, not a (semi-) finished product to be presented “as is” or as “as potentially will become” (at the expense of “as becoming”). In general, more attention seems to be paid to piling on new credentials and experiences, or replacing lost and obsolete ones, than to re-interpreting them. Yet, personal development has two forms: changes in skills, challenges and experience vs. changes in understanding, valuation and interpretation of them. Tailoring a resume to a specific job, by shifting the emphasis or highlighting/downplaying and editing out details, is a variant of this latter growth process, to the extent that it imposes an alternative perspective on, as well as of, the job seeker. Of course, many employers hire personnel with an eye on their potential to grow into new talents and positions. But many do not. For the latter, especially in non-professional employment, both the employee and the resume are stone blocks on sand, ideally never to change, always to grind on and be ground up. Advancement available to most taxi drivers means whatever ground can be gained in stagnant rush-hour traffic, quite unlike free forward flowing strokes or streams of fleeting water. Even those employers betting on employee “becoming” are eyeing what an employee will be, “future being” as an asset, at some future time, when he has become that, rather than focusing on his or her becoming, moment-to-moment, day-to-day. This is reflected in the fact that job descriptions describe what an employee must do and be, more than what the employee may and can become or even must become, however quickly or slowly. That’s not unfair. But it does somewhat distort the realities and potential of our existence, especially when our jobs have job descriptions and routines chiseled in unchanging stone. On the other hand, such watery Zen metaphysics of the ephemeral tends not to make its way into the workplace—neither as an inspiration nor as an actual job opening, e.g., for a Zen instructor. 3. Observe, ponder and cherish the being in the becoming resume, and the becoming of the being: At first glance, it isn’t clear what the point of water calligraphy is supposed to be, or whether it really is supposed to have or make one. Lots of processes, e.g., evaporation of dripped rain water from warm stone, have no evident purpose and simply are. But if I had to impute a point to the sidewalk water calligraphy, I’d hazard the guess that two of its core takeaway intents are to make us appreciate what things are by making them changing—indeed, transitory—and therefore precious things, and to appreciate catalytic change through awareness of what those changed things were, however momentarily. In simplest terms, being is the setting for the diamond of becoming, becoming is the setting for the diamond of being. In less poetic terms, what your resume says you are should highlight and evidence the process of your becoming that and provide a glimpse of the process of your last, current and next becoming. Conversely, the twists, turns and other changes in your life documented in a resume should, as processes, call attention to not only what you have been between these transformations, but to any core of you that endures and defines who you are and what you are about. Like any work of art on a sidewalk, a wall or paper, a resume should embody “unity in diversity”: the diversity of career changes and their effects, unified by underlying core goals, values, constraints and resources that remain constant, if any of them do. In strategic job-hunting terms and resume writing, this means balancing whatever in a career that is unchanging and unchangeable (such as an undergraduate major and graduation date, or fixed core moral values, such as honesty), with whatever has driven, supported or diverted changes (such as a marriage, divorce, birth of a child or a promotion). However high-flown this talk of “balanced being and becoming” may sound, it’s what most good resumes embody: a carefully crafted, harmonious blend of those things that have been and will remain fixed and unchangeable mixed with the changes that have created and been created by them. “Diligent team-player and detail-oriented” (being) beautifully complements “currently preparing for my C.P.A. exam” (becoming), just as the solid and eternal lessons of water calligraphy blend so well with the ephemeral water used to convey its message. That’s one more water calligraphy message to be brushed on, rather than brushed off…. …and to be heeded while still “wet”. Note: This is one of a series of articles by Michael Moffa while on the road, on the scene and on the job in China, autumn 2012.